One of my favorite Christie novels: intense, emotional and moving, from start to finish, I'm involved one hundred percent in the story. I've re-read the mystery more times than I can count and yet every time I pick it up, I'm engrossed. 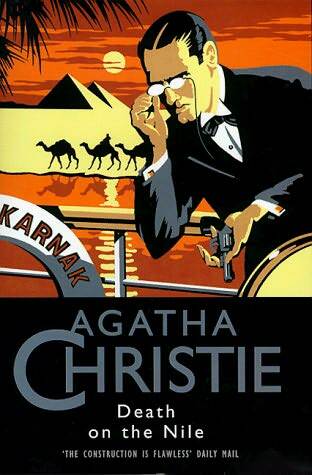 The twists and turns, the character portrayals, the happy and unhappy endings, all go towards making this book one of Agatha Christie's best. Jackie's honeymoon doesn't end up as she had planned - especially since she's not even on it! Things take an unexpected turn when her fiance falls for her best friend, the young, rich and beautiful Linnet Ridgeway. Jackie is convinced that Linnet went all out for Simon and didn't give a thought to their friendship, and her revenge is simple: follow Linnet everywhere on her honeymoon. Be the thorn in the new couple's happiness. But would she commit murder? It looks like it when Linnet is found murdered - shot through the head. Simon is convinced of Jackie's innocence and it seems he is right. Jackie simply couldn't have done it. But then, who else has a grudge against the young heiress? Simon is oblivious, but lucky for him, Poirot happens to be on the same cruise and has formed opinions of his own. Can it be that Linnet was murdered, not for love and revenge, but for her money? The suspects on the boat increase with this new motive and Poirot has his work cut out for him. Luckily he meets an old friend, Colonel Race, who is on board for a secret mission of his own. With plenty of motives to go around, the truth stays pretty well hidden. The murder was very well planned - but that wasn't what kept me interested. It's the play of all the characters involved and the emotional drama that keeps you hooked. Jackie and Linnet may hold center stage, but there are plenty of other interesting characters who manage to attract attention.